Finished Object: Position 5 Pavlova! Here she is, all finished! I meant to post this last night, but the internet at our house ground to a halt and refused to be revived. Next morning after some fiddling, it’s back. Whew. 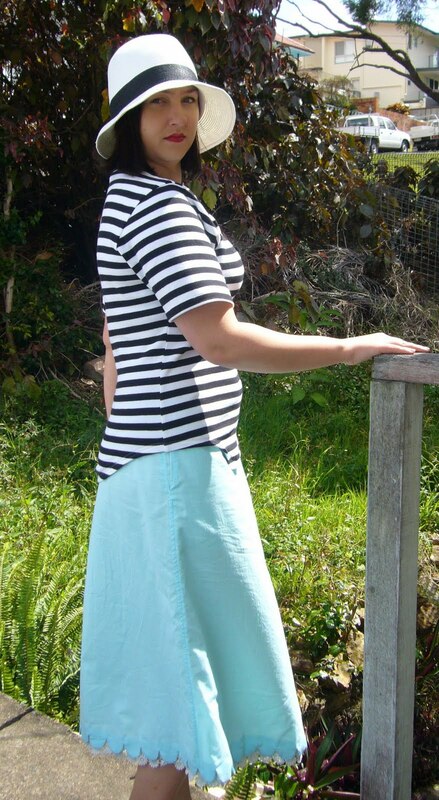 This skirt was originally my Position 2 skirt– the one where I abused the horsehair braid hem. I’ve had a few emails since then letting me know I was doing it wrong. Yes, I know. 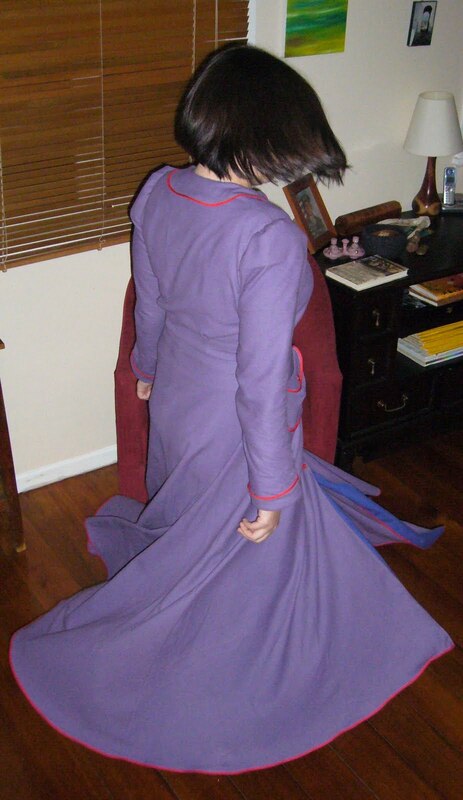 The thing is, it would be weird to make a series of posts about circle skirts without mentioning horsehair braid. 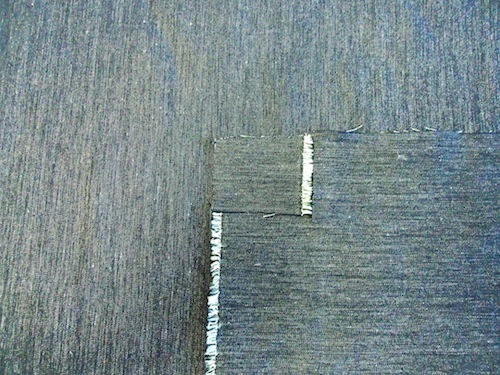 There’s plenty of information in the internet about application of horsehair, and I made a brief visual reference, too. I wanted to do something else- to show precisely how the braid reacted to continual wash and wear, a clear visual warning. It’s not pretty, but that’s not the fault of the braid. When I needed it, I couldn’t find any horsehair braid in Brisbane or Australia so MrsC who owns and runs Made Marion in Wellington sent me some. She’s so good. 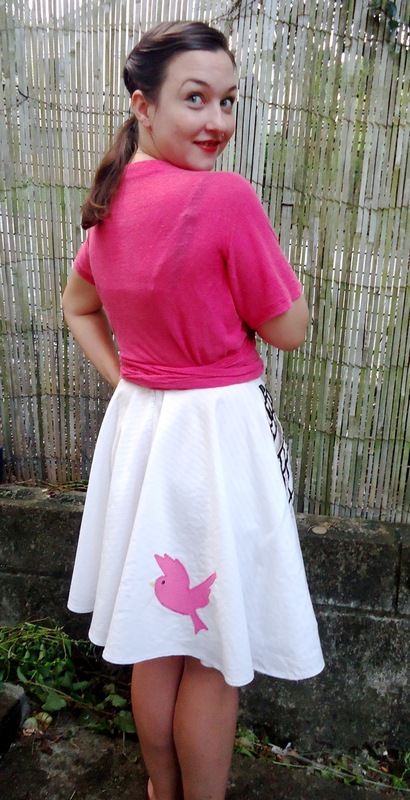 I couldn’t leave the hem looking so terrible, so before I appliqued and embellished my skirt, I ripped out the braid and re-stitched the hem. And another one! Who knew candy pink birds could be so subtle? There’s nothing subtle about the satin ribbon birdcage, though. I built it over an existing pocket but it would be workable (and saner) to mount it on a plain rectangle of fabric which then becomes the pocket. 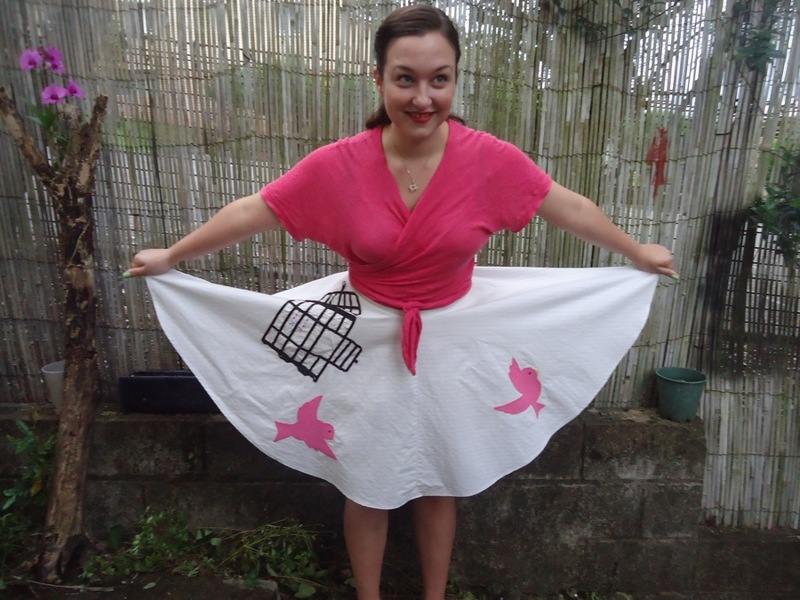 I positioned the bird cage near the top of the skirt as per the inspiration photo, but given my druthers I think I’d like it better near the hem. But this is fine, too! 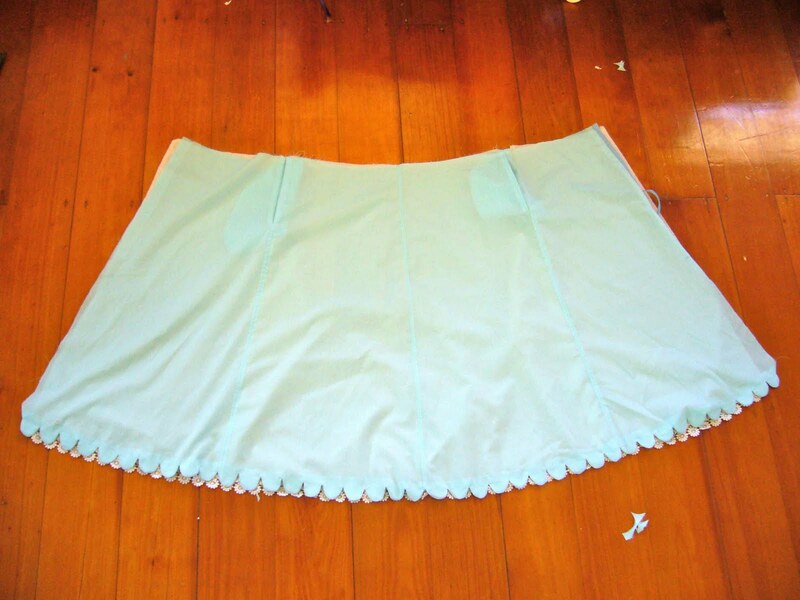 The Position 5 skirt felt more like arts and crafts than a sewing project. It was really fun. I kept messing with the ribbon birdcage, adding and removing pieces of ribbon. Can you see the little bird swing I snuck into the cage? I also removed a “bar” so we have an open door. And Lila the photo-bomber came back! We couldn’t get out somewhere cool to do photos, but she kept me laughing and we had fun in the yard. 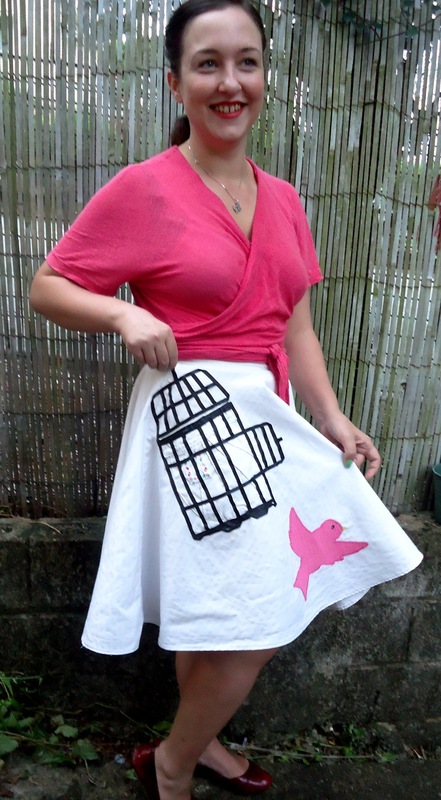 Downloadable bird and cage templates and construction details at sewingcake.com. 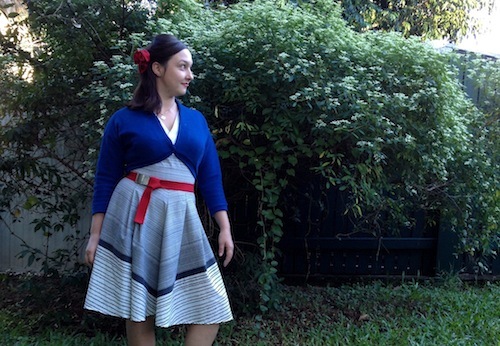 Meanwhile, The Pavlova Wrap Top & Skirt pdf patterns will be released on Craftsy tomorrow! Remember that lovely little pattern from Emma in Montana that showed up on my doorstep last week? I went ahead and made her up for Sew Weekly’s “Mother’s Day” Challenge (without photo-shopping my grandmother’s face on the envelope). 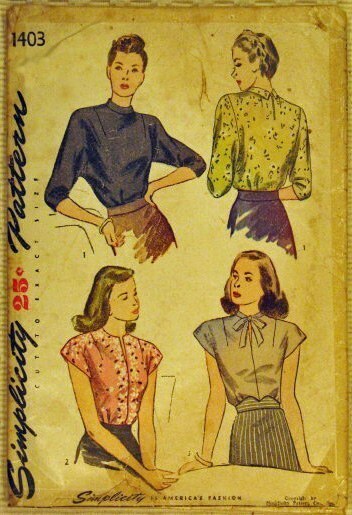 I really think 1950’s fashions celebrate fluctuating mother-bodies without sacrificing style or mobility. Check out my write up along those lines (including the cheap and dubious source of my fabric) on Sew Weekly. 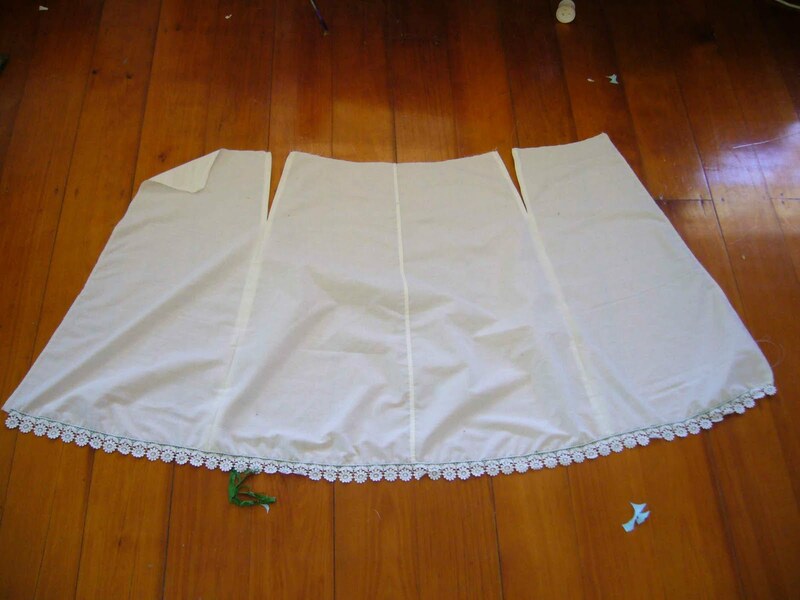 Tip- instead of hemming or facing the lower edges or the sleeve hems, I just used my standard method for binding knit edges. The bolero went together in no time. 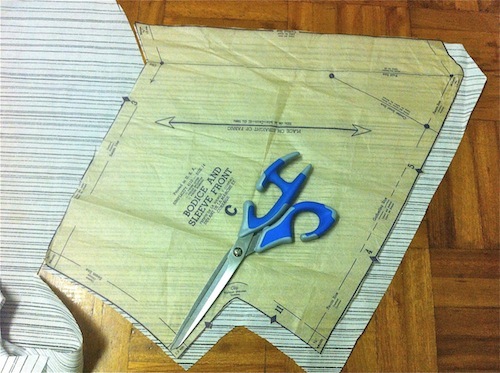 Don’t Overcomplicate the Fit- And Don’t expect to look like the pattern Illustration! No One Does! It’s a fairly simple kimono sleeve surplice with gentle underbust gathers on a midriff band- nothing too tricky to fit. 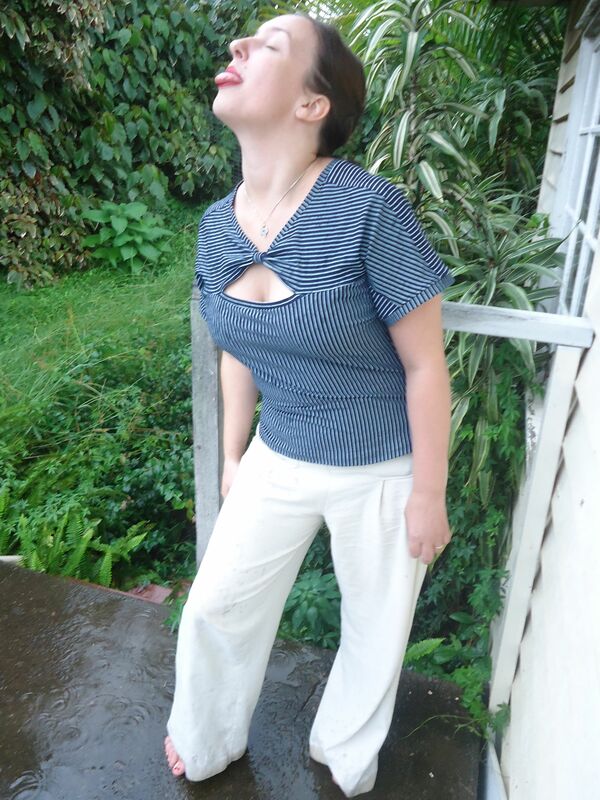 Past Stephanie (from a year or so ago) would have agonized over a full bust adjustment and all that jazz, but Present-day Stephanie knows it probably wasn’t worth it for a relatively unfitted top. Present-day Stephanie is a little lazier and more experienced. 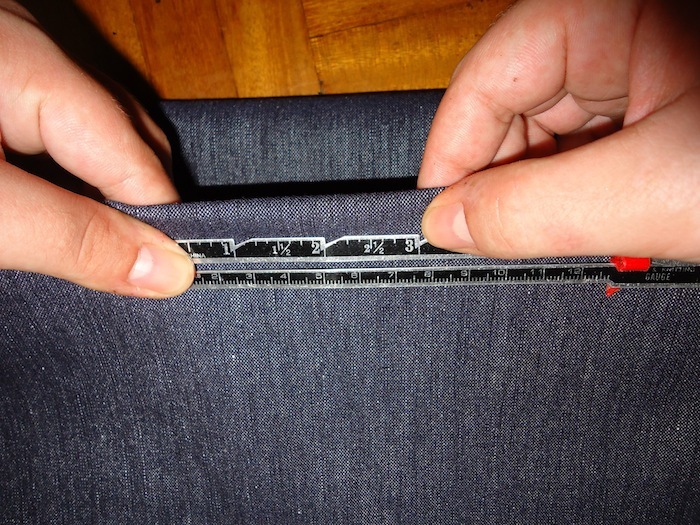 I cut it about 5/8″ longer on the front bodice and 1/2″ wider at the side seams on all pieces. I know the 1950’s size 32 back fits me fine, so I left it as-is. I do love matching stripes, it’s not terribly difficult if I cut the pattern pieces one at a time instead of on a doubled piece of fabric. 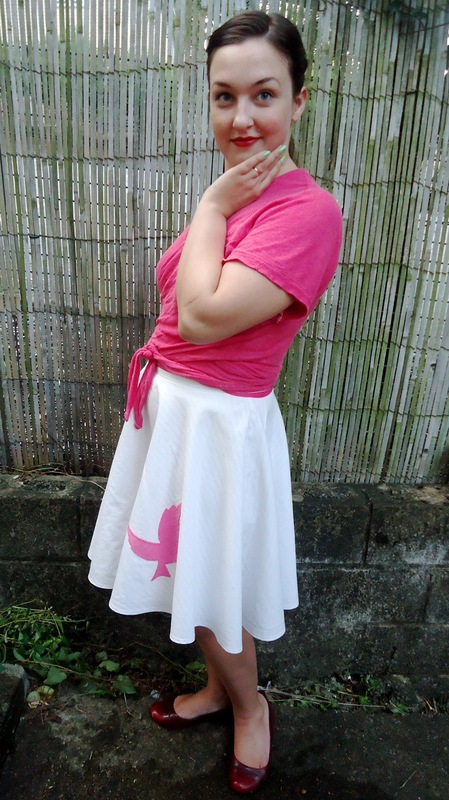 Once I cut the first bodice front, I flipped it so it was right sides together with the remaining fabric. The stripes on my duvet cover were irregular, so I took a little time to fiddle around and make sure the stripes on my pattern piece matched the ones on the fabric before I cut. 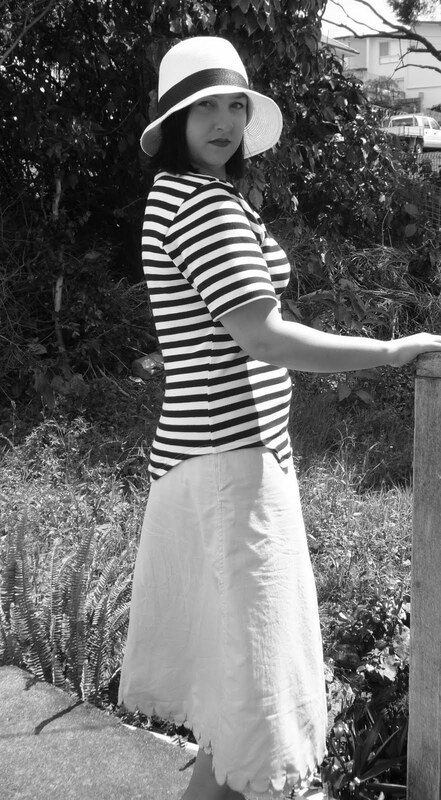 This makes stripes-matching very, very simple. With very few exceptions, I only use invisible zippers. 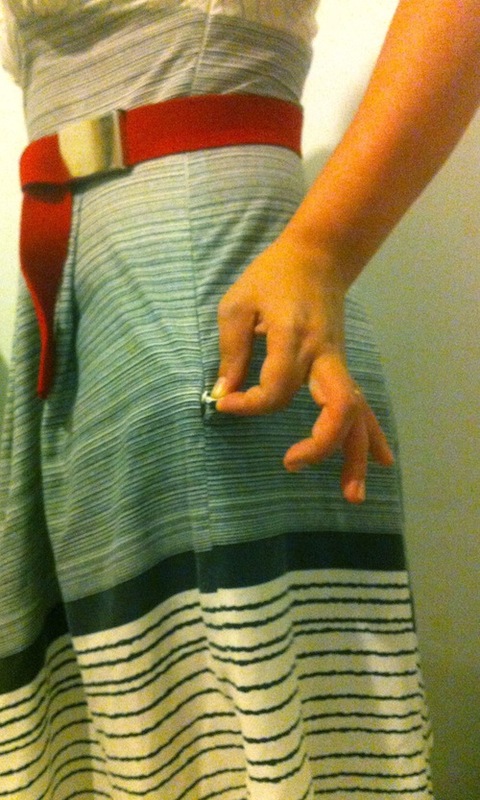 I like to insert them in the side seams of my dresses- that’s my preference. 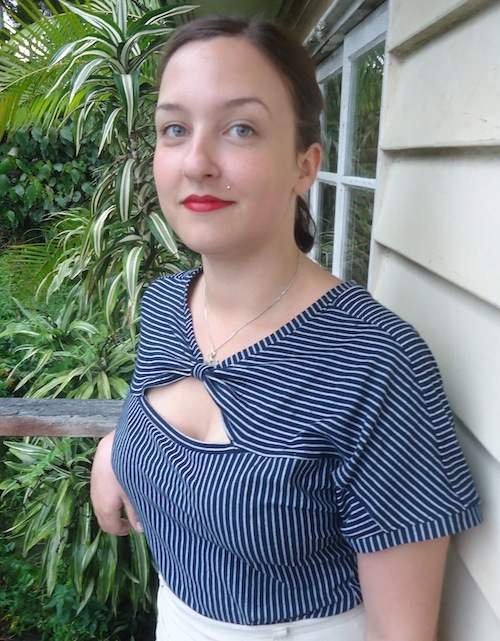 If I haven’t mentioned it before, I live in a bastardly hot climate, and I used to HATE wriggling into my dresses on steamy afternoons when getting ready for evening classes. Then, once the dress is on, I have to find my dresser husband to zip me up, or go through all kinds of yoga to pull the zipper up. Irritating. I “fixed” this problem by buying longer zippers (easier to get in and out) and by putting them in upside down. I’ve been doing this for years now, I don’t know why I never mentioned it. It’s much easier to pull a dress zip down than up. I don’t know why. 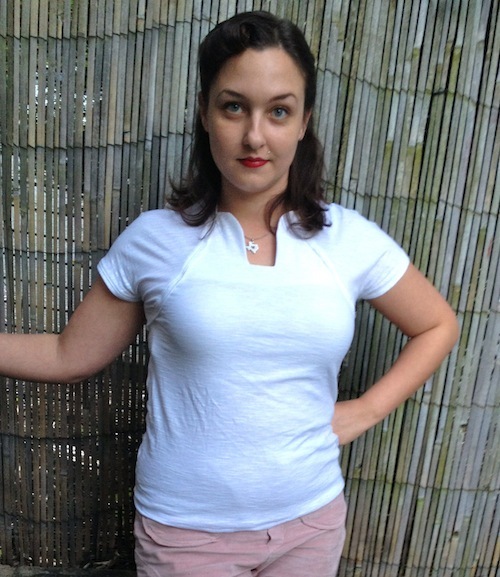 Finished Object: 40’s Charm Hack and Tee! It’s finished! I dropped off the radar completely for a few days, thank you for being so understanding. I don’t know what I had, but it was awful. The past couple of days are a blur, I drank soup and vitamin-C smoothies Stephen doled out and caught up on Sherlock Holmes. Except I was so out of it, I can probably re-watch them and they’ll seem new. Then I woke up this morning, was alarmed to discover it’s Friday already and felt much more like myself- except for a croaky voice. At any rate, I put this version of the 40’s Charm Hack together in about an hour and a half this afternoon. I simplified the design, removing both the lower ruching and the bust ruching to highlight the interesting neckline and the faux-lero seaming. I used the same wonderfully slubbed linen-cotton jersey as Lacy Blank Canvas and SpinaLace. I like wearing white, this jersey blend is very soft and easy to work with, and besides it’s what I had lying around the house. 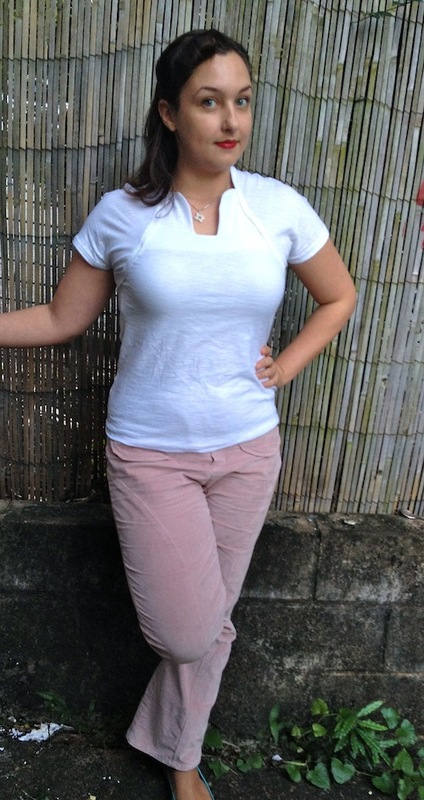 And most of my whites are pink now and I miss my white tees. 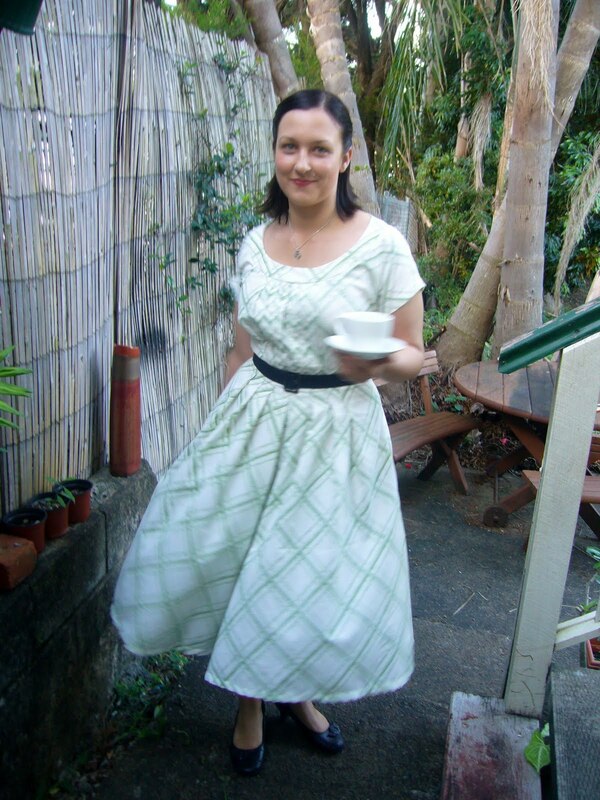 I’m wearing the hack here with Minerve, a linen-cotton woven skirt cut from a late 30’s/early 40’s French mail-order pattern. She’s a workhorse skirt. I also slightly lowered the neckline, as a sharp-eyed commentator pointed out my original neckline was a little higher than the inspiration. I like it. 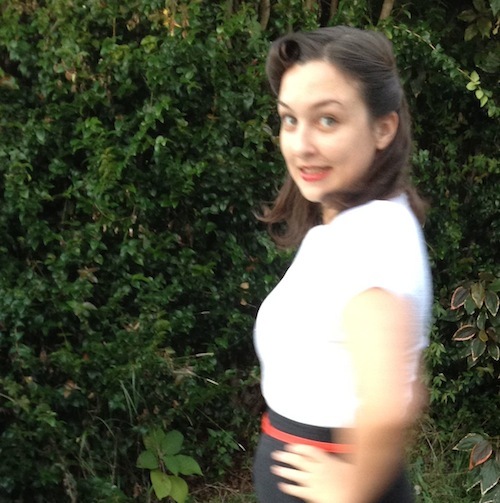 I even put my hair up in a reverse victory roll to keep the 40’s vibe going. I haven’t worn this style much since I cut my hair last year, I forgot how much I love it! 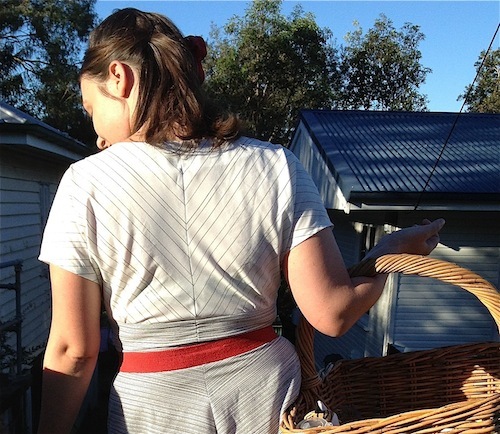 To download the pdf of the hack (with heaps of construction photos! ), click the 40’s Charm line drawing above. Should I make her into a pattern? I will if there’s interest, I already drafted the sizes to make sure it would work- so that’s half the job done already. May’s Hack will be much more forthright, I’ve had her on my mind since February and I know she works! Fingers crossed I don’t have the same drama and can get her out by the end of the month! Once again, thank you so so much for your thoughts and kind words when I wasn’t well. It means a lot to me. Yesterday, I set to work on February’s “Hack” of the Blank Canvas Tee– The Bow Tie Tee. 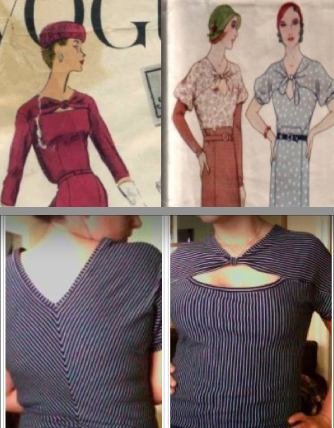 I drew inspiration from two dresses from the 1930’s and the 50’s combined with some navy and white pinstriped jersey I had lying around. It’s leftovers from a t-shirt I cut for my husband. A t-shirt I have yet to actually stitch together. 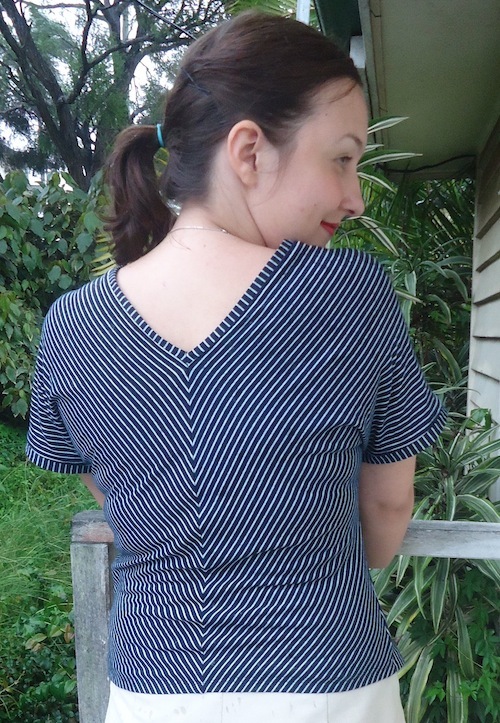 I wanted an interesting back because all the simple tops I’ve been sewing lately leave me longing for something a little juicy like matching pinstripes along a “bias” seam. 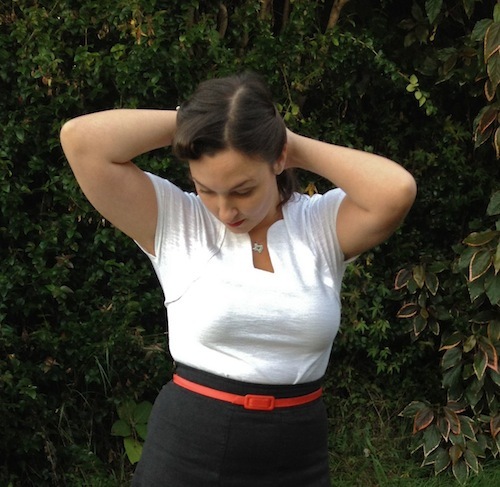 Of course, you could always opt to make a plain and simple back. 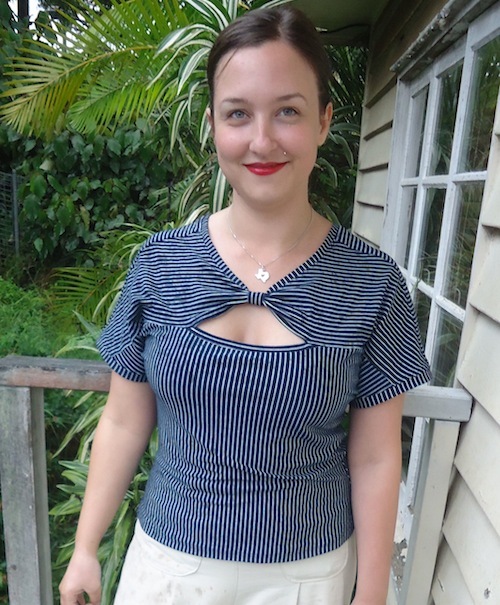 I’m happy with this top, but I want to take it into dress territory. 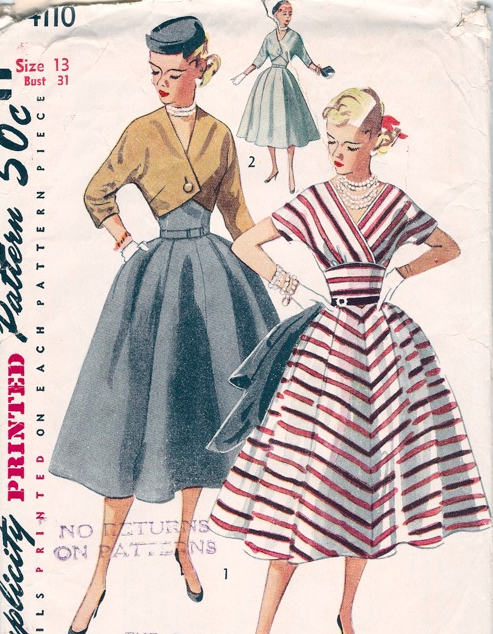 I like the sound of a knee-length skirt with four box pleats (under each apex point…), perhaps in plain navy. Yes? I like having a self-imposed monthly design challenge, and I like sharing my process here. If you’re curious about what future months may look like, take a look at my Hack Ideas board on pinterest. 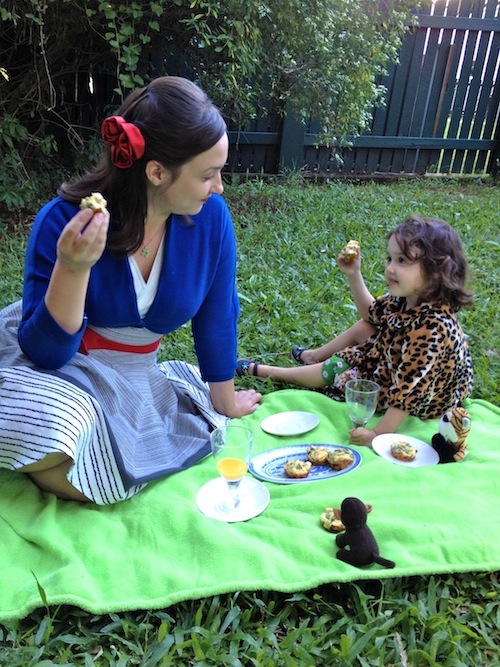 I’m easily swayed by re-pins and “likes”– I see these hacks a collaborative project between me and you lovely ladies of the online sewing community. 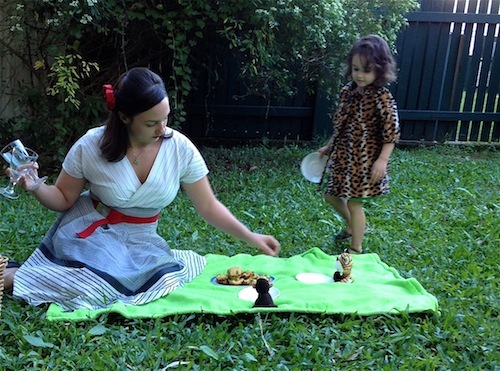 Without letting this project take over the blog (yawn! ), I plan to post the month’s design inspiration in the first or second week of the month. 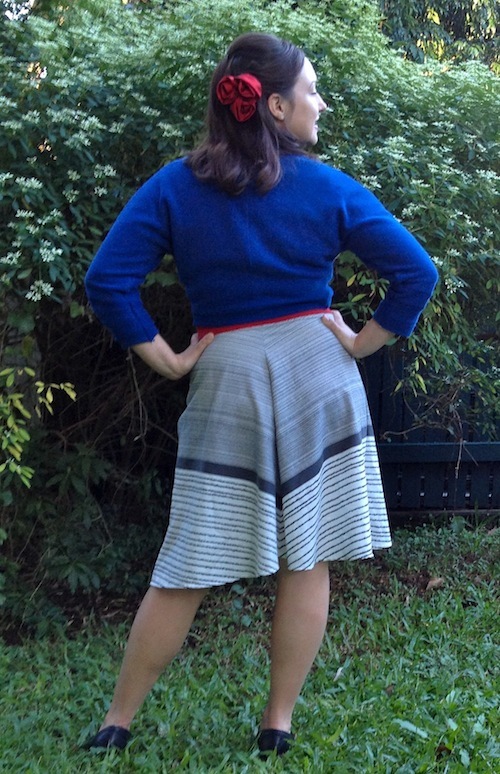 You all give me thumbs up and/or down, and then I go do some pattern chopping. 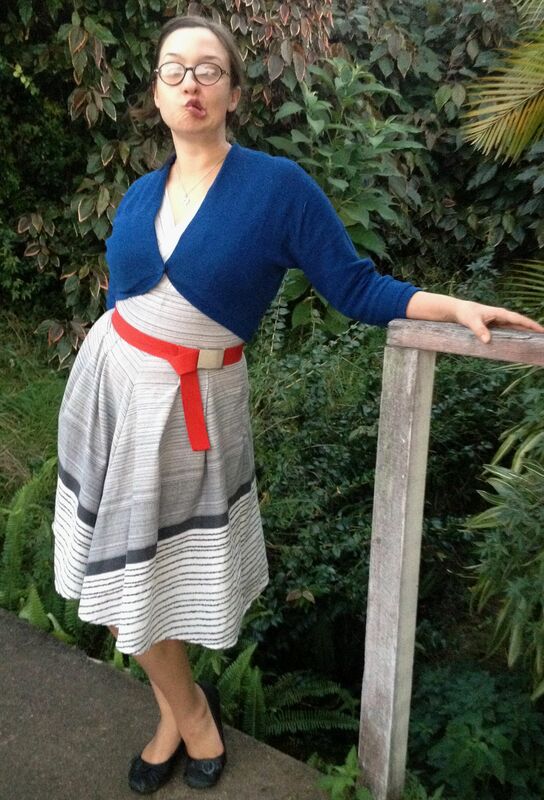 I show you my finished garment (a top or a dress or a cardigan or sweatshirt) in the second or third week. 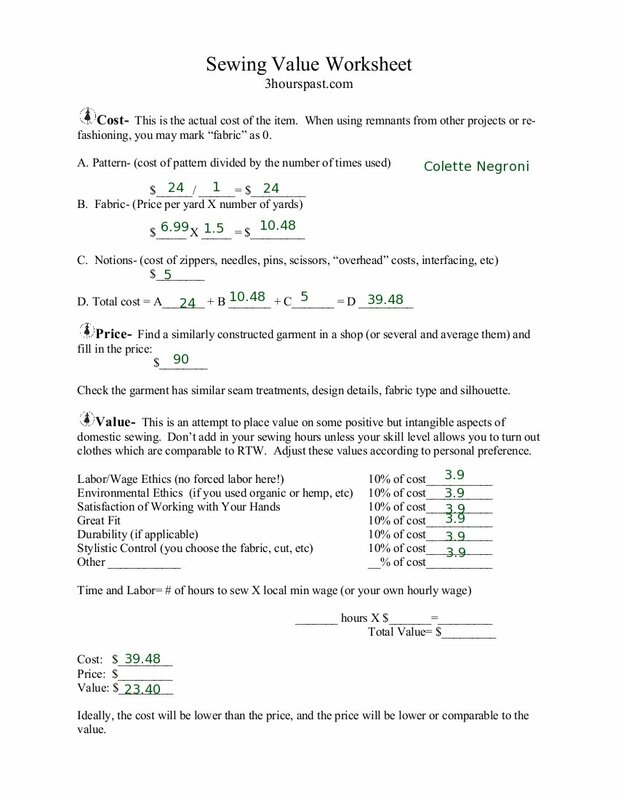 Fourth week- I publish the drafting instructions. 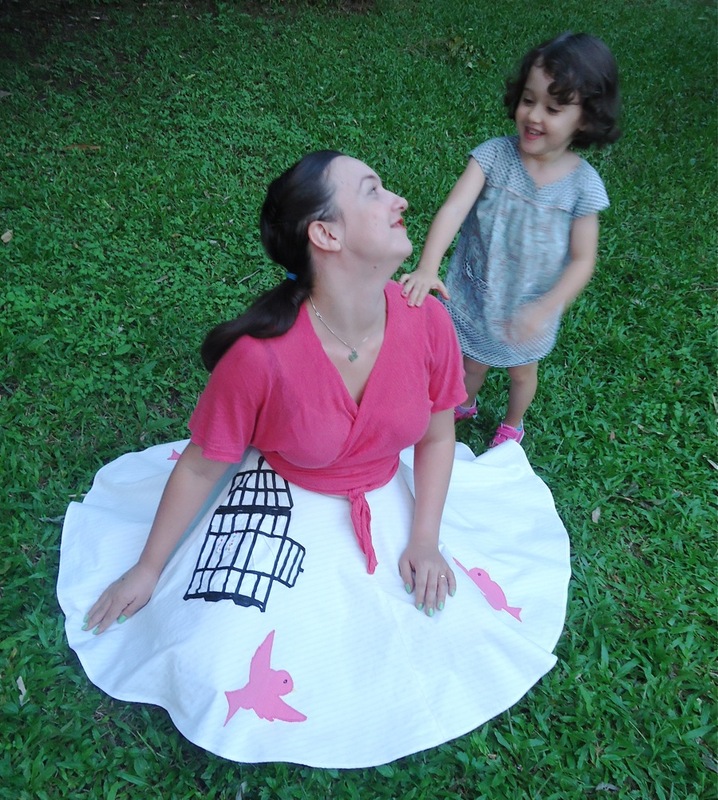 Then I publish a multi-sized pattern on Craftsy- that wasn’t originally part of my plan but I’m pleased to do it. How’s that for a game of sewing? Note: I *believe* I am caught up with my emails, but if I owe you one please remind me! My little girl keeps getting into my mailbox on my phone and re-arranging my universe. I bought the stretch denim on the far right the other day. It stretches along the selvedge. I knew if I posted that, someone would tell me their experience with it. Thank you! 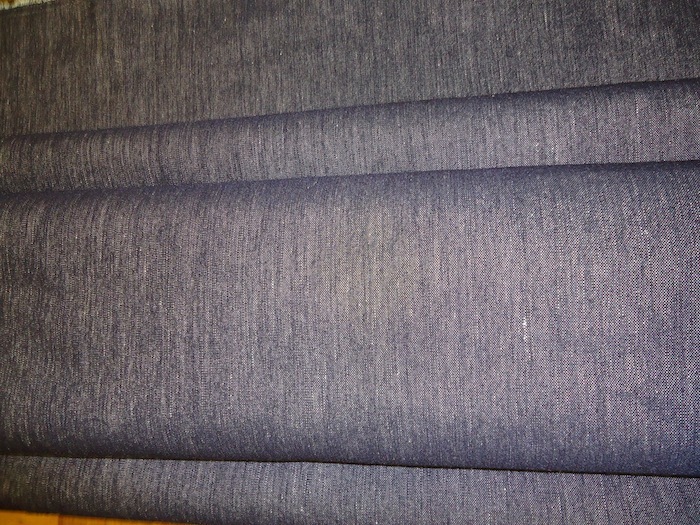 ClaireEmily mentioned picking up selvedge stretch denim and showed me her finished Linda pants. 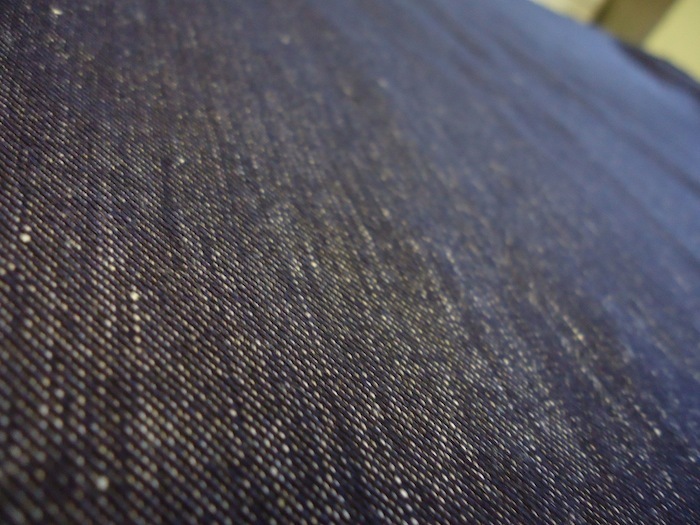 Sherry said warp stretch is great if you like selvedge hems- neat. I took some time to play with the fabric before I washed it, so I could better understand how the finished garment might behave. I call it “torture tests,” and it’s great for allaying fears about working with a “new” or different fabric. It’s fun, too. They’re like wooly nylon thread, which is often used in sportswear. The tag said lycra, so I think it must be a similar type of thread. I like the way it drapes, but I won’t be draping it. 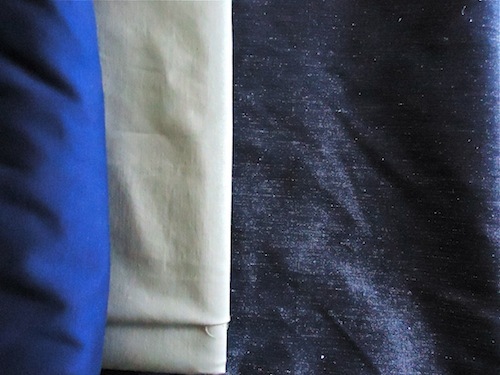 I’m making 7/8 length stretch jeans- I might make them flare slightly from the knee to show the bounce in the fabric, but maybe not. But there’s a problem (geeking out here)- Wikipedia says the paired threads should be the warp threads, and that’s what it looks like in the diagram. 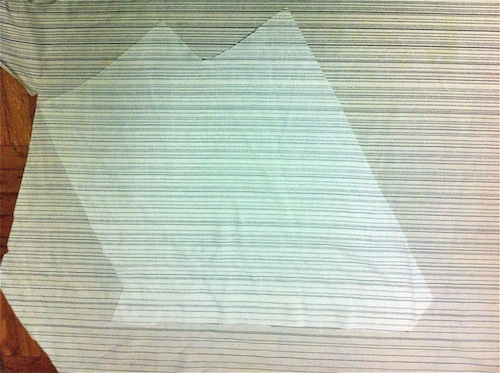 That means the single threads in the diagram would be the cotton ones on my fabric. So did they turn the twill weave on its side along with the stretch? Seems likely. 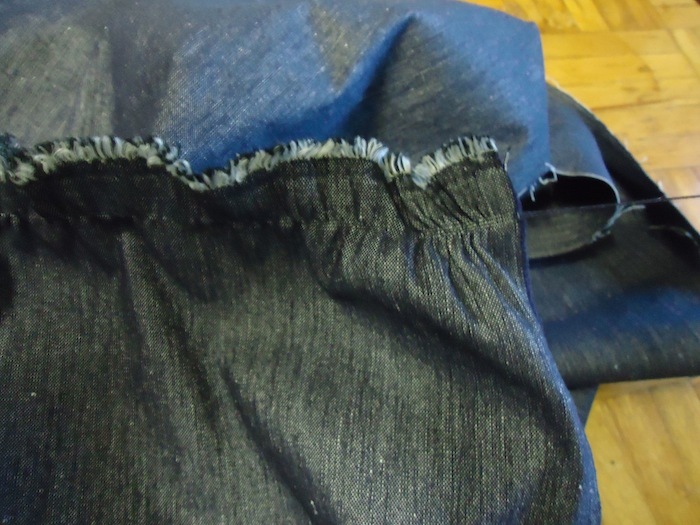 I folded the fabric along the selvedges to test the stretch. This is not stretching, 3″. It stretches to 6″ with not-so-great recovery. It goes to 5″ with best recovery. How do I calculate the stretch? Is it 3/5= .6 which means 60% stretch? 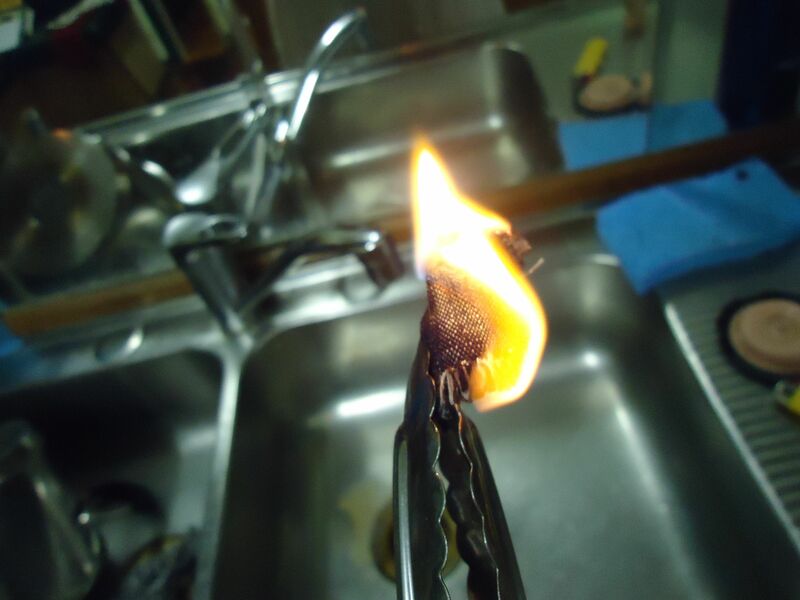 Then I set the swatch on fire. 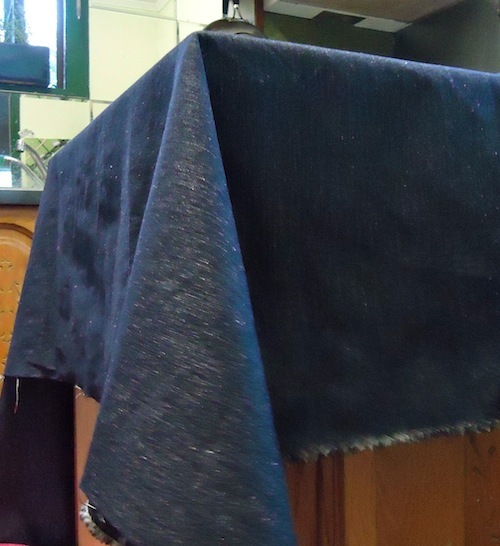 I do this more often than strictly necessary, I tell myself it’s to better test unknown fabrics in the future. 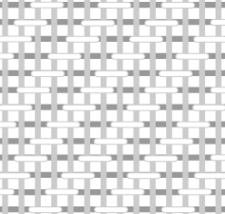 Burn charts are a handy resource, but I like building experience with the fabric. I occasionally drape lengths of new fabric around me shawl-style while I potter around the house to feel its weight, elasticity and drape. Every blue moon I pin a piece of troublesome fabric over the curtains, so I see it every day and ponder what it should become. 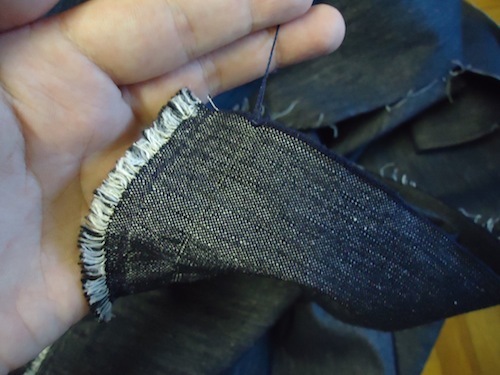 I don’t examine every piece of fabric this closely, but do more often than not because it’s interesting and I get ideas about the final garment- how it will behave, what I can make it do. I’ll wash it next, then do a little sample sewing. 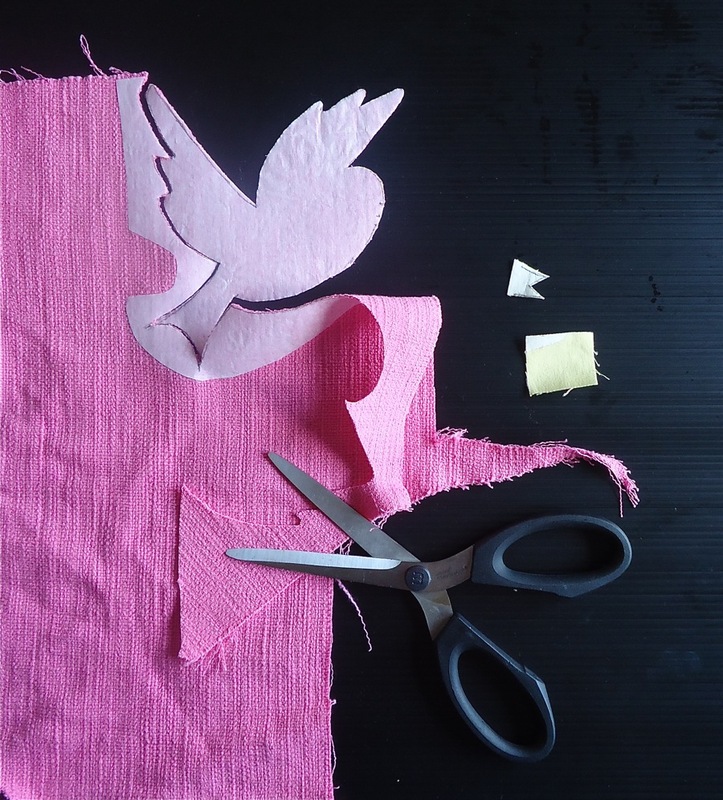 What do you do when you have a new or different fabric to play with? If you haven’t yet, feel free to enter the Testers for Pants Blocks Giveaway. It ends on Wednesday. 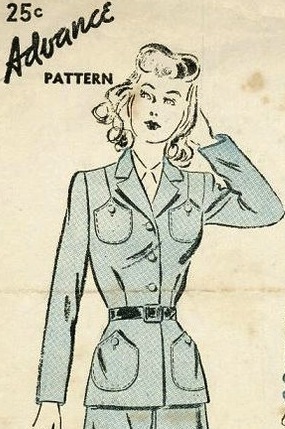 I haven’t done a pattern alteration post lately, what would you like to see? Have you been properly introduced? 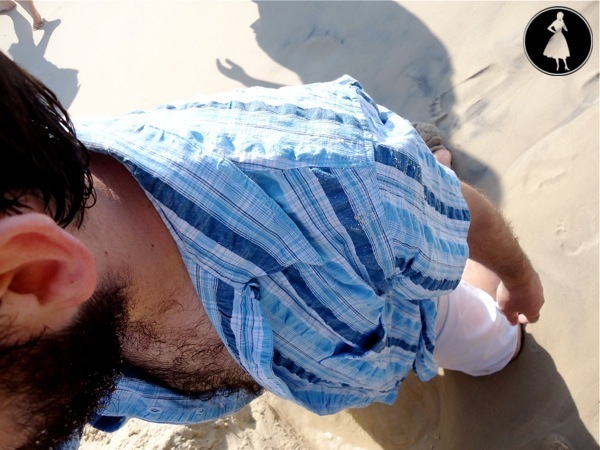 This is my husband, Stephen and he’s a field ecologist. 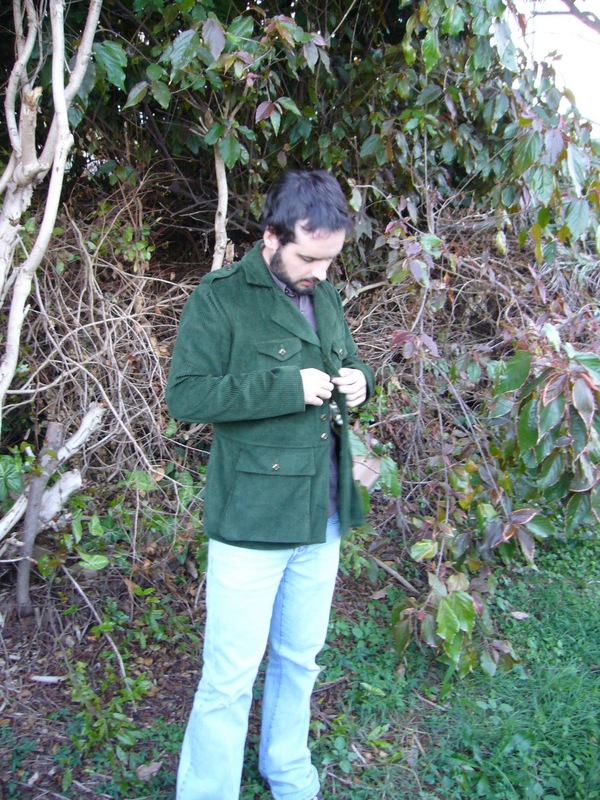 (The fact we have the same names put me off dating him for a while at first, but his charm won me over in the end…) I finished this jacket for my husband several months ago and never blogged it. 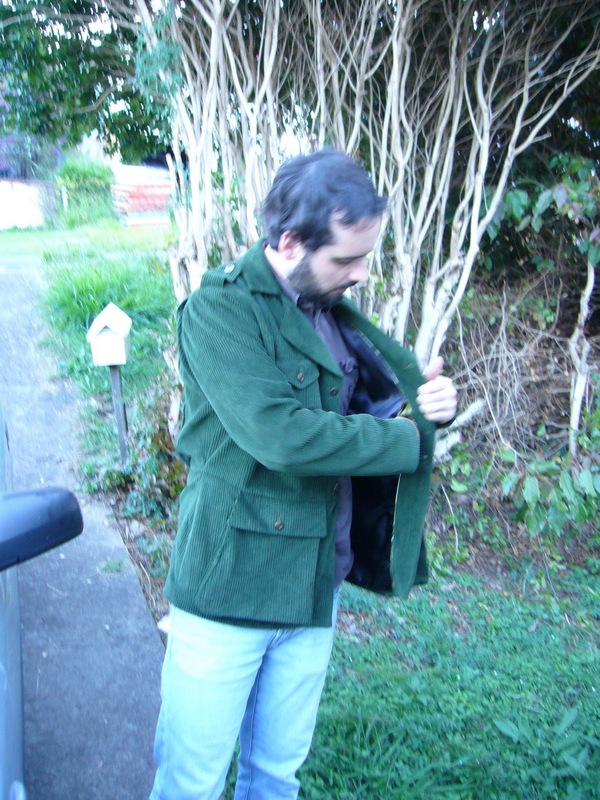 He saw my De-militarized Jacket and wanted one for himself. 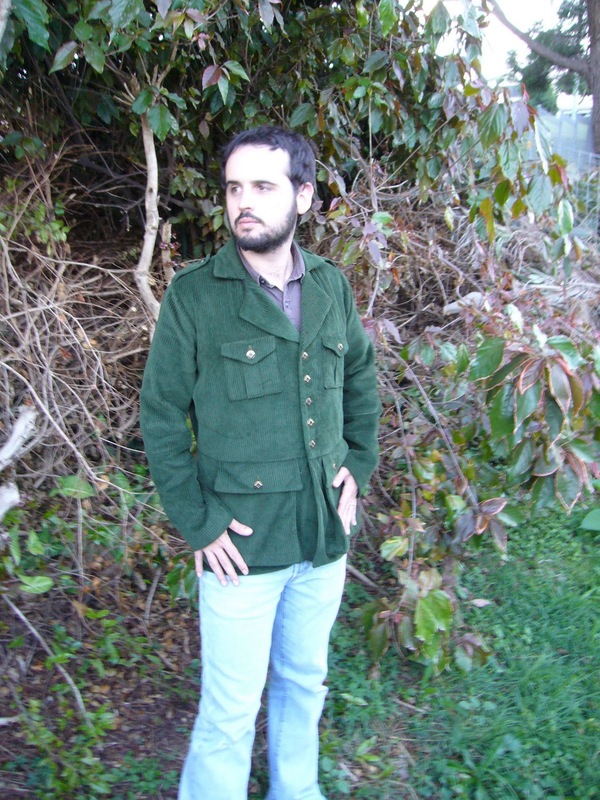 I was happy with how mine turned out, my most pleasant jacket-sewing experience to date so I agreed. I had to re-draft most of the pattern to fit his body but I did use the same design features: pocket pieces, epaulettes, peplum, back yoke and “action pleats.” It was fun to adapt the garment for him. Not as fond of whimsical linings as I, he vetoed the camo satin lining I originally wanted to use, but I managed to sneak it in anyway for the lining piping and pocket linings. 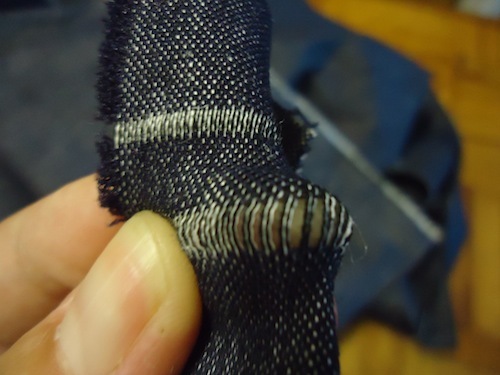 I used K. King’s invisible pocket lining. It’s such a cool feature to put into a garment, I plan to use it whenever possible in the future. However, after all was stitched and pressed and photographed, I noticed one of the breast pockets sits higher than the other. 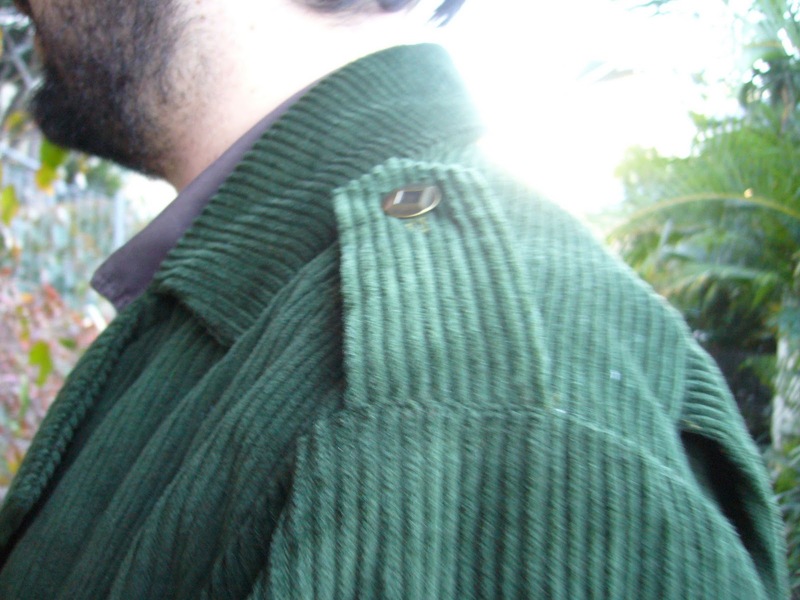 I obsessed about balancing them, pinning the second pocket while he was wearing the jacket. 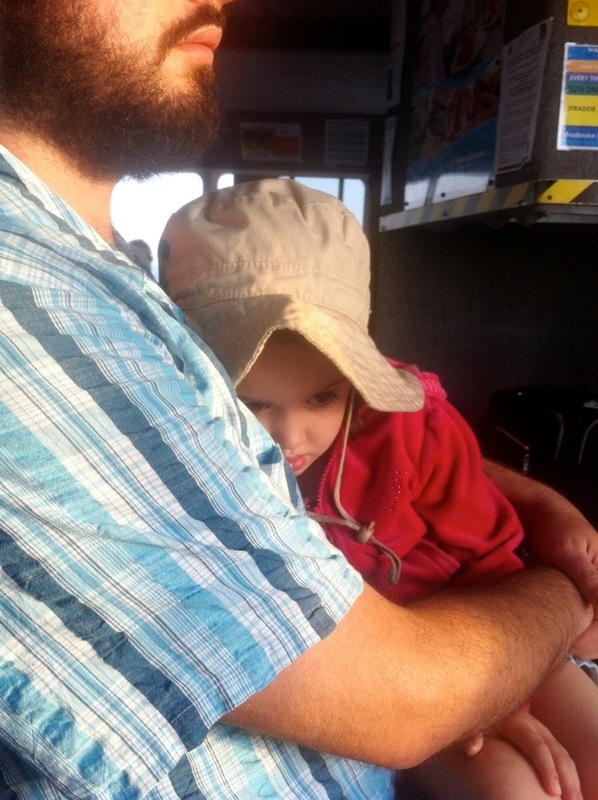 He’s a stickler for balancing pockets and often helps me balance them on other projects. This time, after we decided they were finally balanced, he took off the jacket and I “double checked” by folding it in half and seeing if the pockets matched up. They didn’t. So I re-pinned (again!) and stitched without checking. Then I put in the lining and finished it. I kept telling myself this winter I’d fix them, but the difference is not noticeable in person. It’s a mystery. At any rate, the jacket kept him warm and stylin’ all winter. 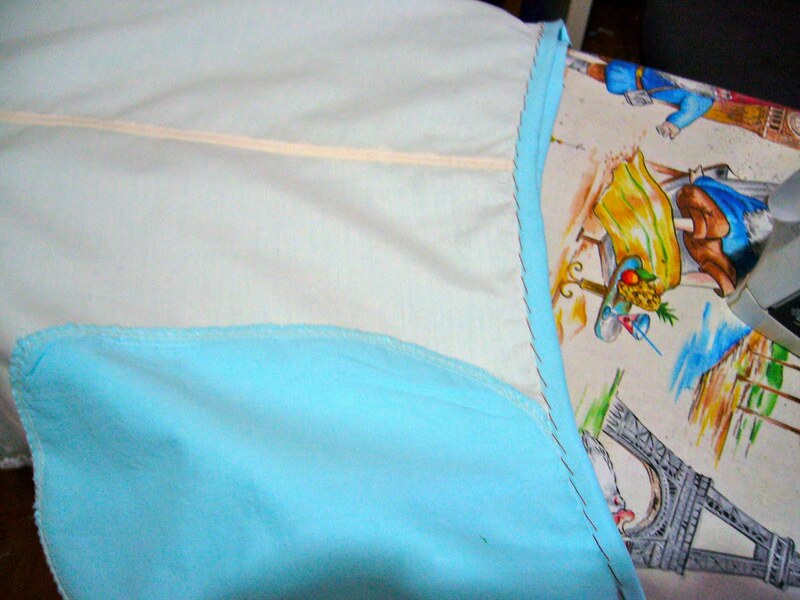 If I make this again, I must remember to make the bellows pockets less angled near the side seams. 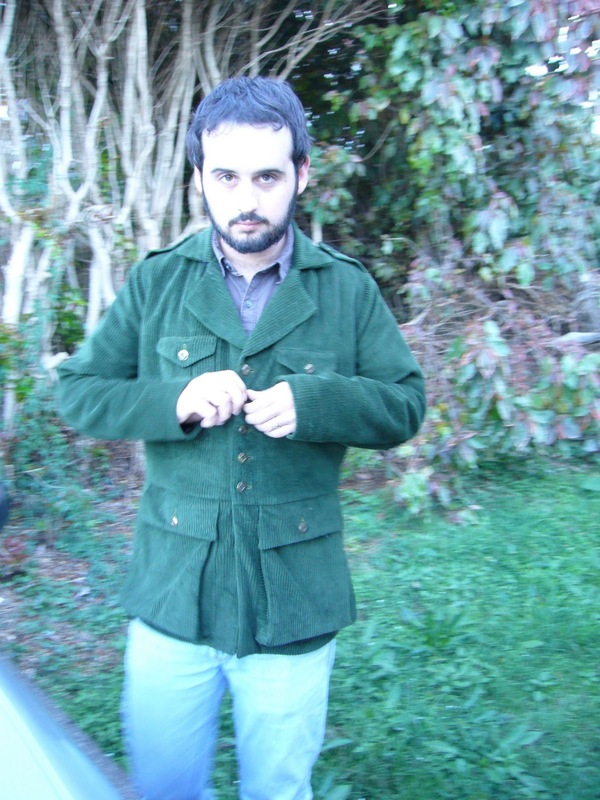 We went out several times in our “matching” blue and green jackets. Since we style ourselves so differently, I think we avoided matchy-matchy couple dressing. He often wears jeans and graphic t-shirts. I’m more a blouse, skirt and kitten heels girl, even in casual situations. This is the other view from the ever-so-adaptable Advance 2960 which spawned the two jackets above. It’s nearly finished, I’ll be sure to post it soon! I’m sorry for not updating more frequently lately. Work is quite heavy at the moment, and he’s working to FINALLY finish his dissertation. I’m so proud of him! 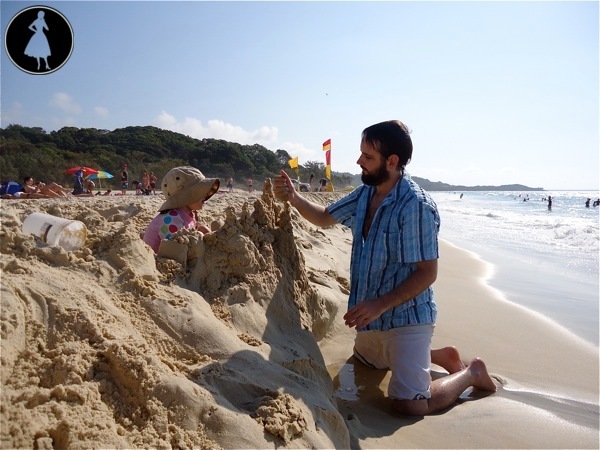 The downside is we’re both so busy it’s hard to find time for– well, anything. That should change soon. He’s handing in his paper and I handed in my 2 weeks notice at work. I’m really excited about what the next few months will hold, and I can’t wait to share my plans with you all. Soon! Very soon! In the meantime, I’m still around and reading everything even if all I have time for is blog-skulking over my morning coffee. Yep, hubris got in the way. 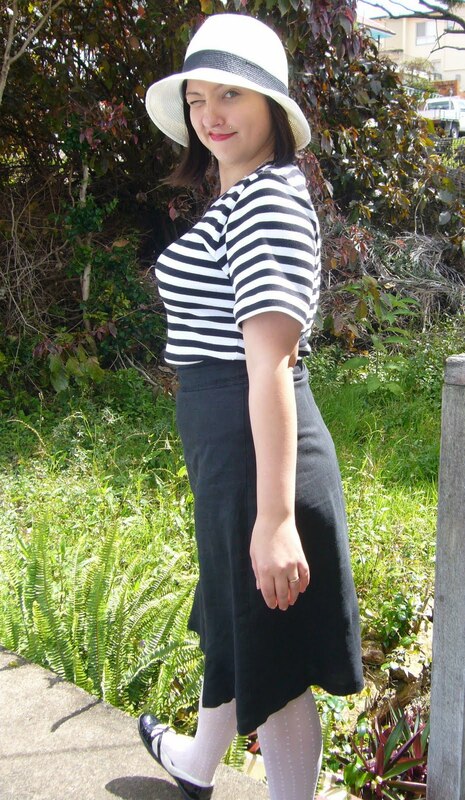 The top of the skirt doesn’t sit at my waist (where I usually wear them), but down around my hipbones. 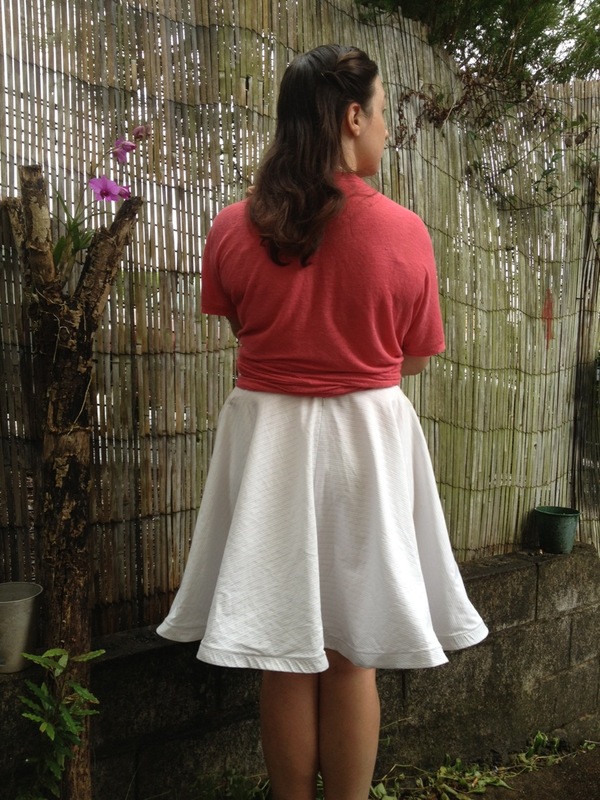 Since this is a summery casual skirt, I don’t really care. Not enough to screw around with the pockets at the side seams, not even enough to take out the zipper. Once a student said to me something like “well, back in the old days people didn’t wear a whole lot of color, all greys and blacks mostly.” I don’t think that’s true, but I think it’s easy to forget that brilliant colors existed before Technocolor. Casually thumbing any old women’s magazine demonstrates that. They often use adjectives such as “eye-blinding” or “violent” to describe color (May 1945). I often wonder how much black and white photography colors ahem our ideas of how people dressed “back in the old days,” even in subtle ways. 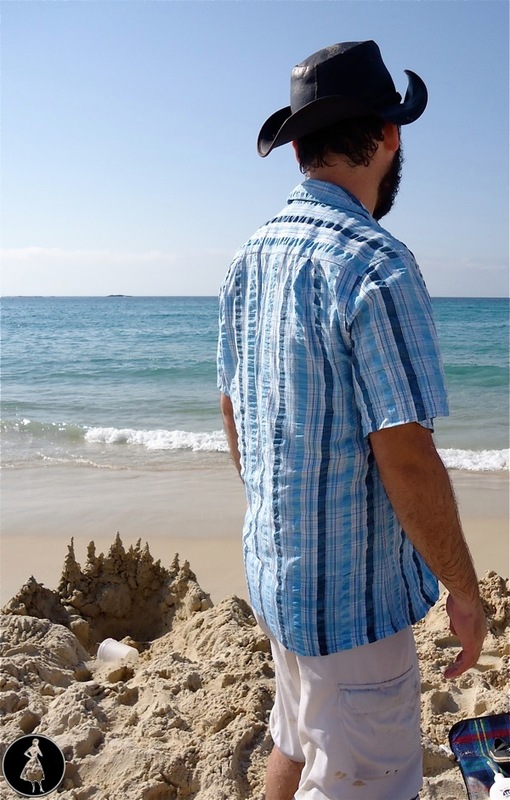 I call the shirt Elsa, after the inspiration from Casablanca. 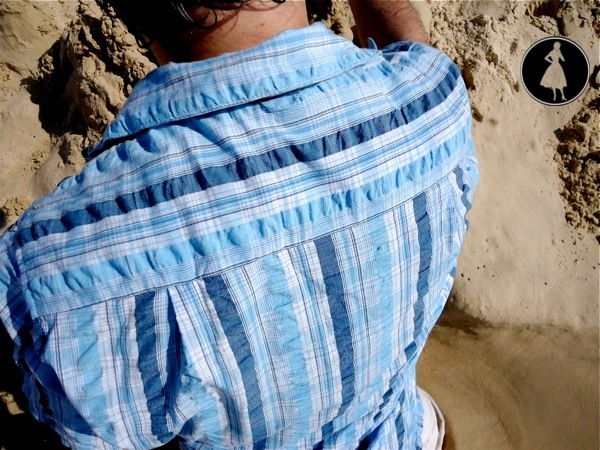 In the summer, I often reach for my husband’s shirts for comfort. We’re much the same size, with different contours. My clothes are often more fitted, while his are looser. While pondering how best to approach this boldly-striped cotton doubleknit, I realized I could use his t-shirt pattern for myself. Easy. I nipped in the waist a little, and shaped the hem for kicks. 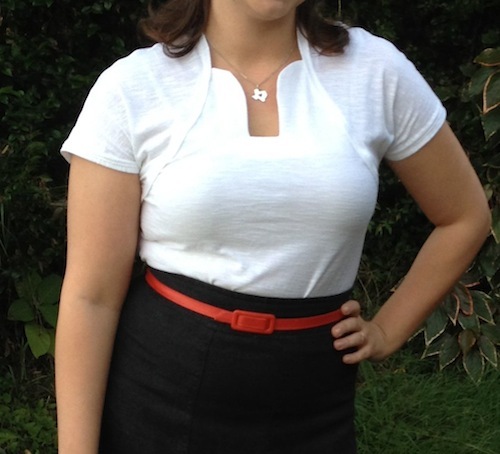 I did wear the top to work today, though I don’t think it will go into the regular work rotation. Thanks for all your kind words when I was sick, I’m feeling better now. 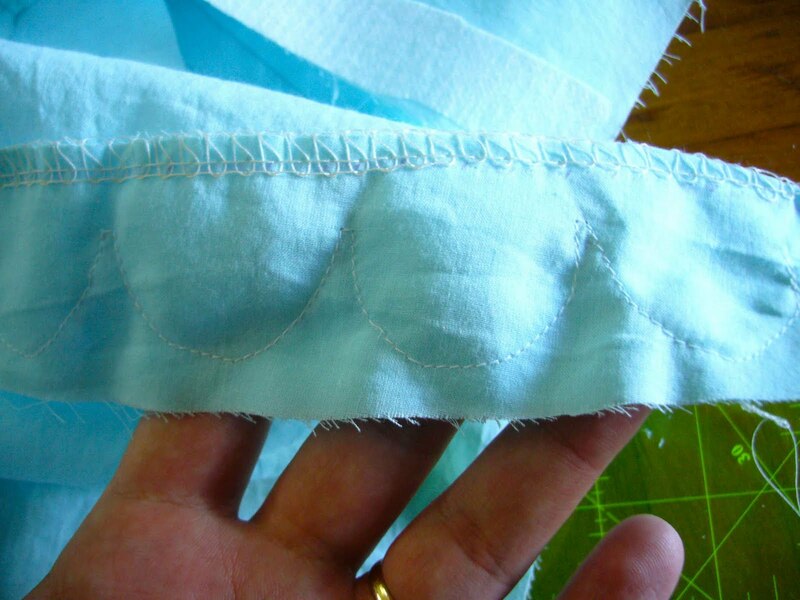 Sherry from pattern, scissors, cloth created a great scallop edge tutorial. My scallops are considerably smaller. If I realized at the outset how much trimming, turning and pressing this would entail, I would have opted for larger ones. I took one stitch across the interior corner of the scallop, to help cut down on puckering. 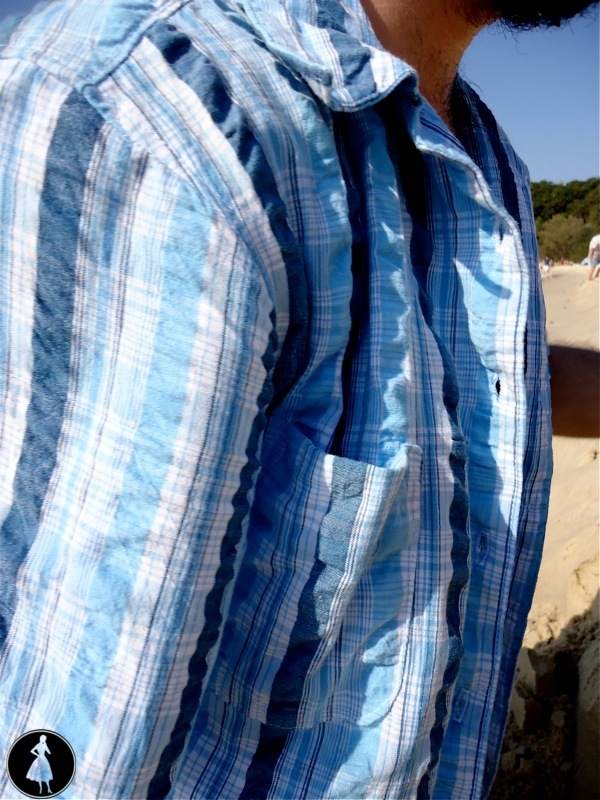 Puckering can be worse in lightweight fabrics than heavier ones. Lining, edged with daisy lace from Minerve. She shrank ever-so-slightly since I made her, so I had to cut the lace off. I’m pleased to re-use the daisy guipure lace (I have a thing for guipure) on this garment, where it is allowed to peek out! 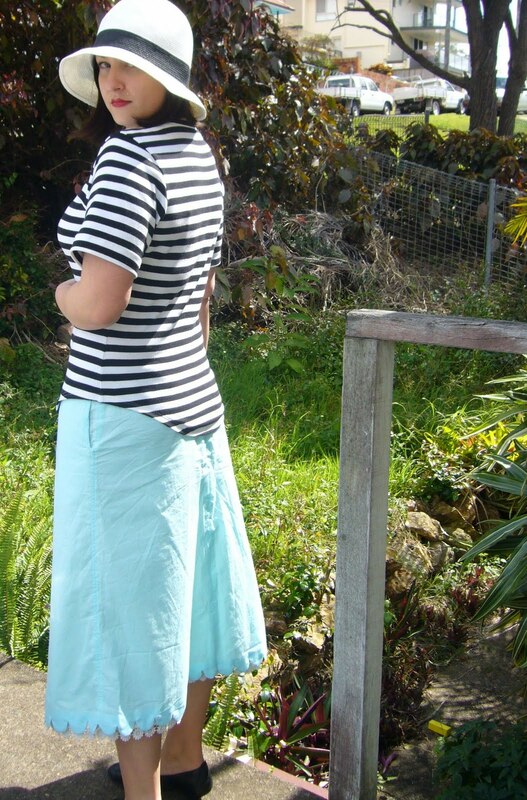 The slits at the side allow the blue voile pockets to slip inside the skirt. My scallops don’t match each other precisely, but I wax philosophical about it. Wise quilters don’t worry too much about matching greens in a quilt, with the idea that we see a pleasing profusion of mis-matched greens in nature, and who are we to improve on nature’s palette? In a similar way, my scallops are as individual as snowflakes and that’s fine with me. They’re also waaaaay down at the hem, so who’s looking? I used red thread to stitch the waist binding on the inside. Note the pocket, slipped through the slits in the lining. No finished pictures yet, I’m not well and look like death- but I’m mending rapidly so I might get some good shots tomorrow. Husband (that controversial arbiter of my personal style) gives this a thumbs up. What worked for me for winter? This is by far my favorite. It has precisely served its purpose. 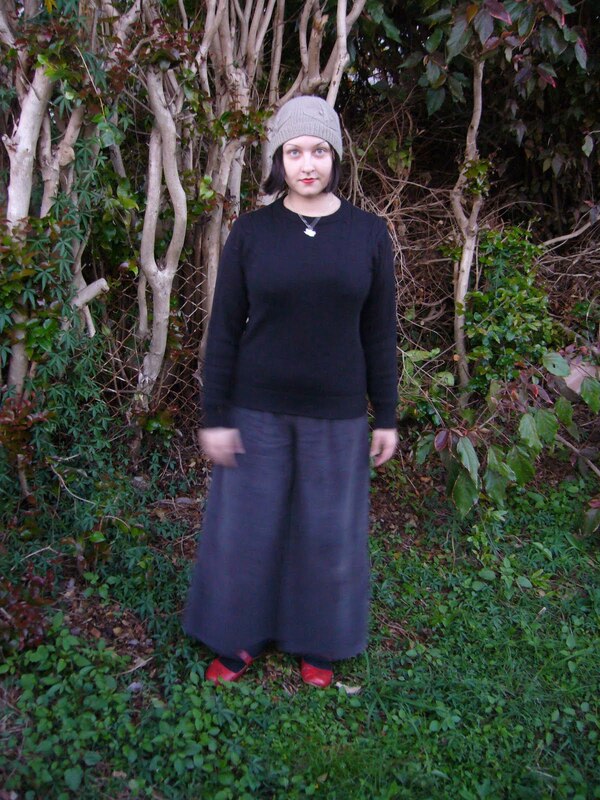 The long flannel skirt made it snuggly, but I didn’t feel completely sloppy around the house. I want to make a similar one in a fine batik cotton for summer, maybe a different style.Fail- Just because the pattern envelope suggests jersey doesn’t mean it’s a good idea. The wool would only have been slightly heavier than the rayon, so it might be firmer but I wasn’t willing to risk it for a house shirt. 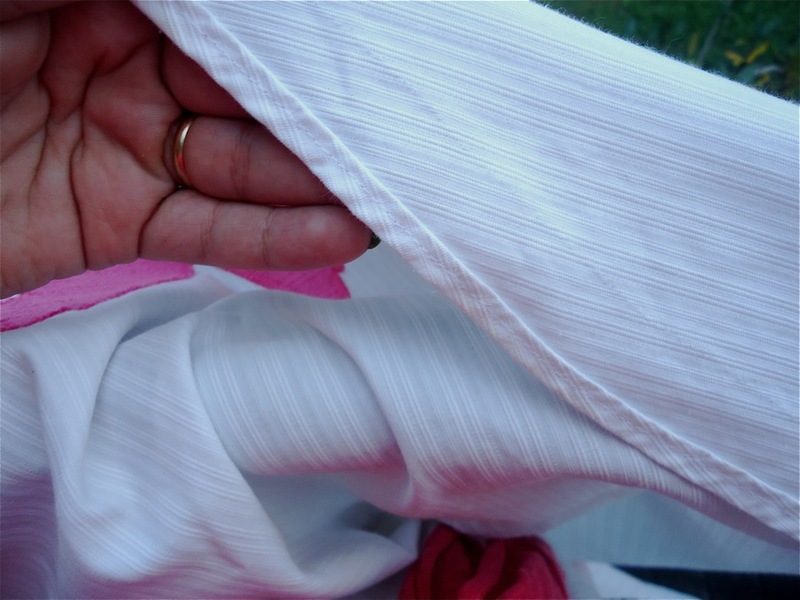 I do like this shirt, and wear it though I never finished it more than a quick muslin. 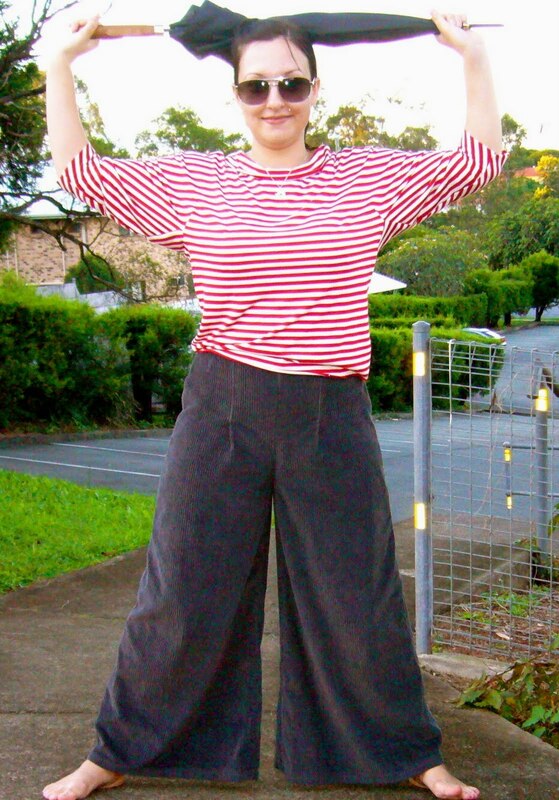 Fail- Those pants were another incomplete failure. They are too short with shoes. 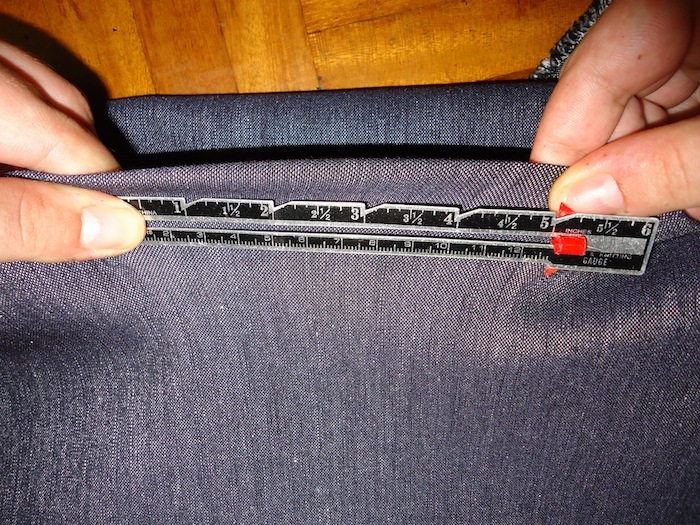 Because I -ahem- measured the hem while barefoot. I like them anyway and wore them all winter. 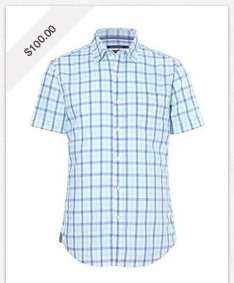 I really, really like this semi-tailored weskit. I reached for it on rushed mornings to pull two pieces together. 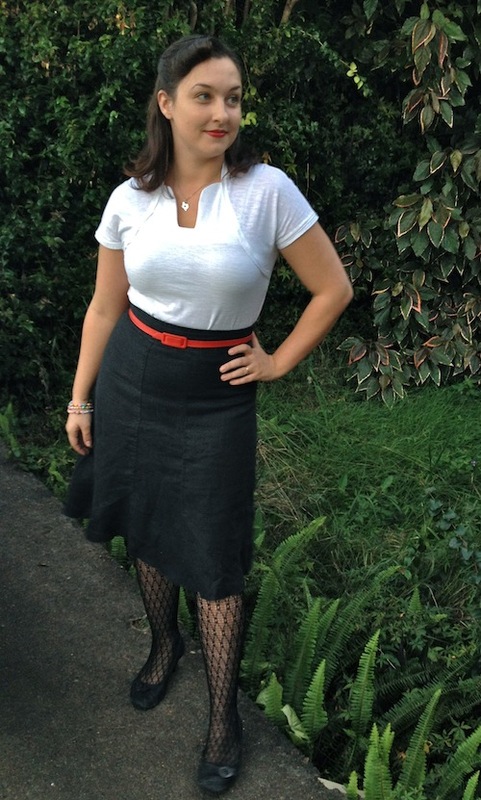 Many of my work basics are black and white, and the weskit (I hope) camouflages a less than perfectly ironed blouse. 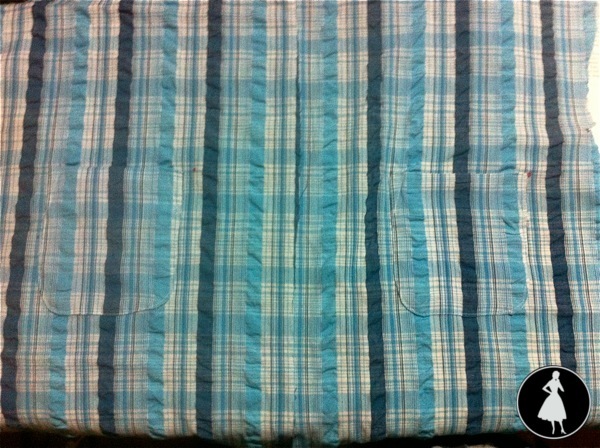 The fabric proved both sturdy and hard to wrinkle. It’s getting to be the bright time of year, every picture from this morning’s Self-Stitched-September shoot captures an awkward face. Time to dust off the sun-jacket. 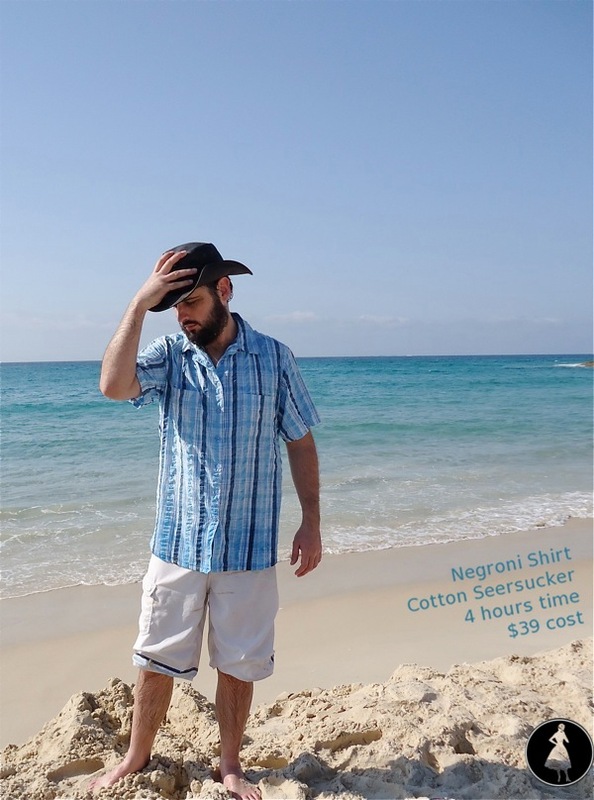 I’m looking at a few favorites from last summer, to help guide this year’s sewing. I’m thinking a palette of crisp white, clear blue-red, baby blue, and aqua. I’ll post more this weekend, plenty of free time. 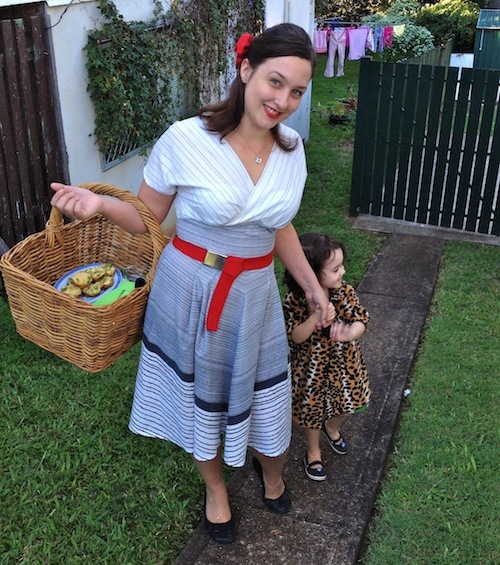 Also, I just saw a post on Dress a Day… I’m so excited, Erin’s blog has informed how I think about clothing and sewing, especially Dressing for Joy. It’s what turned me to sewing for myself, in a style I enjoy. Thank you, Erin.